A hearty thank you to Suzanne over at Gluten Free Saratoga for alerting me to the pleasures of KD's Fish Fry in Ballston Spa. This restaurant offers gluten-free breading and a dedicated fryer so there's no contamination worries. Their cole slaw is awesome and does not contain the egregious addition of pineapple. Although we were too full from the gigantic portions of fried calamari to sample anything else, they have a nice selection of gluten-free desserts. The restaurant is located at 418 Geyser Road in Ballston Spa, just off Route 50 near the entrance to Saratoga State Park. You can check out their website for directions and the menu. KD's is open every day 11 am to 9 pm (Sundays noon to 7 pm) so there's no excuse not to plan a road trip for some gluten-free goodness. This place is freat my wife and I go there atleast once a wee sometimes even more. We travel from Glens Falls because the food is so good. Niether of us ars GF people but it doesn't matter when the food is so good, As a side note they have cookies that are just as good as the meals they have. EVERYONE NEEDS TO GIVE THIS PLACE A TRY, I AM SURE YOU WILL LOVE IT.. I need to be GF but have given up eating anything labelled GF because it is usually not worth eating, until now. Kudos to Dawn (aka the Kitchen Witch) for the most incredible birthday cake. It was a moist and rich yellow cake with white chocolate mousse filling and white chocolate frosting. My kids are not GF and the loved it too. There was no overpowering "bean" taste or sandpaper texture. Unbelievable!!! 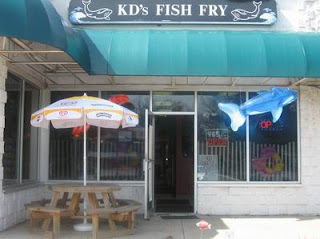 I also have to mention the yummy GF food at KD's, especially the poppers. Thanks! !